I was really hoping to get this Chameleon’s leg done today, because as it looks right now, it’s hard to tell if I really did much since yesterday! Oh well, I put almost two hours into this today and my arm was actually starting to cramp up a bit. I think tomorrow I’ll try something new and do some relaxing doodles on paper. It’s already been three days in a row that I’ve worked on my Chameleon, so it’ll be a nice change of pace to keep things interesting. Not only for myself (I can get bored too, doing the same thing over and over) but for the people that check out my posts and artwork, they can get bored as well. I see it in the statistics and every time I work on the same thing for a few days in a row, the number of page views go down dramatically. It’s not surprising or anything, but it’s good to know details like that. I do want to bring more people to my website, checking out my work and all that, so I just need to keep it in mind that you guys get bored too. 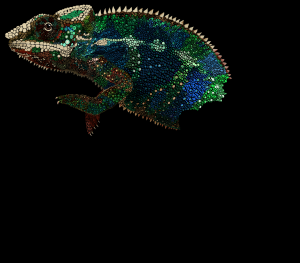 Like I mentioned, it’ll be a nice change of pace to keep myself interested in this Chameleon project anyways. I know I’ll be anxious to get back to working on this guy!